You may have noticed that I eat a lot of salads. I don’t mean to be a stereotypical vegetarian, but I actually just love salad. 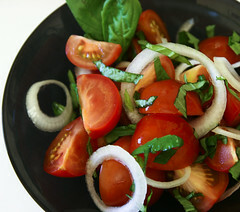 A lot of that comes down to the dressing: I always keep a good balsamic vinaigrette on hand that goes well with just about any salad – green, tomato, bean, pasta, you name it! And hey – stop buying balsamic vinaigrette at the grocery story and make your own. It’s really easy! Tip #3: Learn to make basic vinaigrette and keep extra on hand. People have different opinions on what a good basic vinaigrette should be. Cassie likes hers “light, tangy and slightly sweet” and considers her Apple Cider Vinaigrette an “everyday basic.” I’m a balsamic girl and have found the following recipe to be very reliable. Courtesy of my mom. This makes a big batch and keeps for ages. A good salad is about balance and contrast—the sweet contrasting with the tangy contrasting with the salty, the rough contrasting with the smooth. Etc. You want to fall in love with eating salads, not force yourself to struggle through each one…a salad with some fat in the dressing tends to taste way better and have a better mouthfeel, and, as a bonus, those of us with sensitive tummies can use a little alkalinity from oil to balance out the acid in the dressing. 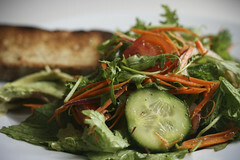 I definitely took Sally’s lead at lunch today, when I had a nice big salad to go with my veggie chili and chive bread. 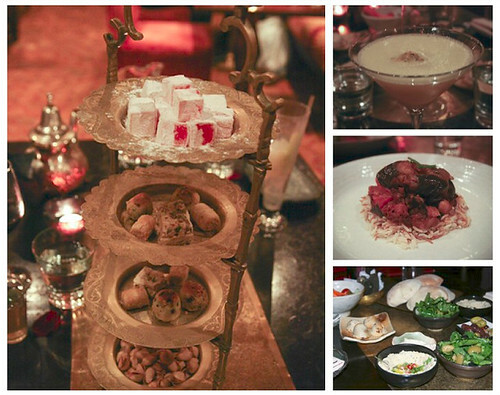 I took this to a whole new level at dinner when I ate out at Kenza, a Moroccan restaurant in central London. There I had an amazing rocket (arugula) salad with lemon, olive oil and olives. So simple but delicious! This, along with a whole bunch of other mezze, eggplant moussaka, and too much dessert, made for a very full tummy. No amount of alkalinity could balance the tummy-enlarging effect of a Moroccan feast! Yoga. A short session, but a start. I did the first two sun salutation of the primary series: surya namaskara A and surya namaskara B, followed by my leg stretches. Tomorrow I will add a couple more poses. 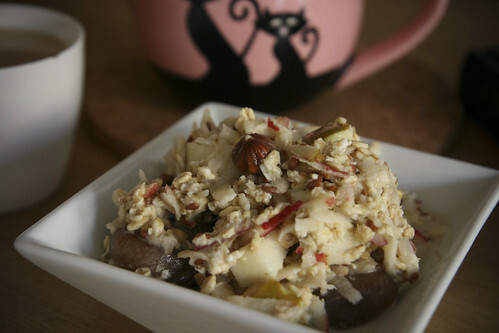 Breakfast: Bircher Muesli with Rooibos Tea. A late breakfast for me – by the time I had tea and did yoga, it was past 8am! Dinner: Moroccan Food at Kenza Mixed mezze of pita bread, rocket salad, baba ghanoush, olives and raw veggies. Followed by eggplant mousakka with rice. Turkish delight and baklava for dessert. To drink, passion fruit martini, glass of red wine, and sweet mint tea. Veg lover, dog owner, hill walker, wild camper, avocado addict, nerd. I write about how to be awesome through a "smarter fitter" approach to eating, drinking, living and working. Thanks for the shout-out. The food you ate looks great—my stomach is rumbling now ha ha. I think I’ll make a salad to go with our veggie-chili-topped baked potatoes we’re having for dinner! I love just a small bit of honey or agave in my balsamic vinaigrettes I make at home. They cling to the leaves better with the dressing at that viscocity. @Sally – veggie-topped potato sounds delicious. Like the idea of the honey with the dressing… mm, I bet a little cilantro would do well with that. @Carlos – I think maybe I didn’t make my point clear. Ranch dressing, that’s just wrong. Low fat dressing won’t help you lose weight. Cutting calories will help you choose weight. How you do it is up to you, but I firmly believe that removing GOOD fat from your diet is not the way forward. True, there are some good low-cal dressings out there… I’ve always been a fan of Annie’s Raspberry Balsamic vinegar. But even then I would want walnuts or salad to balance the taste. Again, all good, REAL food. You can eat fat and lose weight, in fact, you need to eat fat to lose weight. Check out this http://www.wired.com/medtech/health/news/2005/05/67473“ rel=”nofollow”>Wired article. 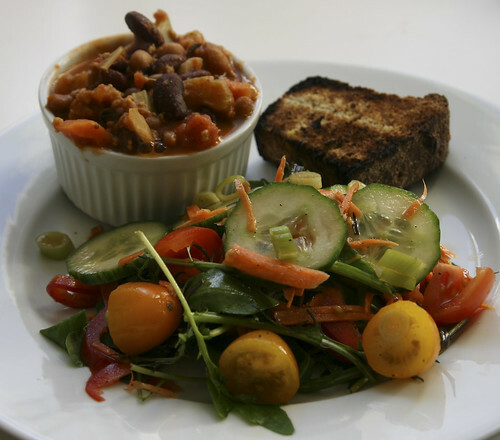 Using low fat dressing is far from being a “extremely low-fat diet”. Besides, you can loose weight by many many methods but the important question is if you can continue eating that way and if it is healthy for you. So when I read an article like the one in Wired I just have to say, off course you can loose weight by eating some fat but is it healthy for you in other important ways? By the way a dressing becomes light or low fat by adding plain old water to it so that it is more diluted. Greetings. Carlos.. the answer is YES, fat is VERY healthy for you in MANY important ways. Fat supplies essential fatty acids for growth, healthy skin, vitamin-absorption and regulation of bodily functions. 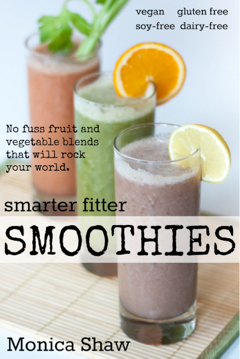 Plus it helps you feel full and satisfied. Plus it’s good and tasty and makes us happy. I’m barely scratching the surface here but I hope you get my point. It’s likely we’re just in two different camps on the issue, but on the fat one I stand firm – fat is good. I made the dressing—extremely tasty. I was surprised, though, at how thick it is—the consistency of ketchup, at least for my batch. Still tasty though, and works in a salad. I’m a fan of balsamic vinegar too, especially if I’m having tomatoes. It’s a perfect match. It’s a great tip to make batches of dressing to keep in the fridge. I do the same each week and find it very handy. And my husband also takes a batch of his own favorite dressing to work each week to keep in the fridge to have with his lunches. Another favorite way for me to eat salads is just a drizzle of olive oil and a squirt of lemon, especially with lighter tasting baby greens, and it couldn’t be simpler! And Monica, that muesli of yours looks very good! @Leisureguy – glad you liked the balsamic! yes, it IS thick, and it will solidify in the fridge so be sure you take it out a little while before you intend to use it. it’s good on sooo many things besides green salad – you can use it as a baste for portabello mushrooms, for example. @Cassie – Olive oil + lemon is wonderful! I love this with crispy lettuce like romaine. Add a little oregano and you have a nice greek salad. Great tip on bringing homemade dressing to work. So much better (and cheaper) than that bottled stuff. And you don’t have to worry about transporting dressing… or winding up with soggy, pre-dressed salads at lunchtime (a sad affair! ).